One problem that can be seen often on water heaters is the corrosion that occurs around the water inlet and outlet fittings. There always seems to be a problem with water heaters. That statement may be a bit severe, but I feel that it could be true. When water heaters are replaced, the installer may not take the time to do the job properly (which seems to be the case most often), or the new unit does not quite work in the location of the old unit. Sometimes, the installer is using what is already there, trying to make the part work for the new unit, instead of using a new part. One problem that comes up is the corrosion on the connections for the water lines due to galvanic action. Alright, this is not the best photo of corrosion, but you can see the problem. The two dissimilar metals of the water line and the water heater are reacting with one another. There is a flow of electrons occurring, which is effecting the material. Corrosion does not lead to an immediate water leak, so we forget about the fact that the connection is deteriorating. I think that most people would think differently about this corrosion if the thought about rust. Take a rusty metal pail. The rust may not be too bad at first, so you can still use the pail. If you do not do something about the rust, the process of oxidation continues. Eventually, the pail wall becomes too weak, and the item you place in the pail falls through the pail wall. At one point, the water pressure will be too much for the wall of the pipe effected by corrosion, and you have a major leak. If you look closely at the water heater fitting, you may notice that there is a plastic ring where the two pipes meet. This plastic is an insert that prevents the two dissimilar metals from touching, preventing the flow of electrons. I wish that this picture could have been better. There was no power to this foreclosure, and it was not easy to have a footing near this water heater, which was in an attic. This connection had a clear example of a problem that I see on a regular basis. A new water heater is installed, but the old parts are used. In this case the plastic that was to keep the two metals from touching was used again. Not really an issue if the connection has no damage. With this connection, I could see that the plastic insert was clearly damaged allowing for the metal to metal contact, which in turn led to the corrosion. If you are having your water replaced, or you are having work done that will cause the water lines to be removed, you may want to look at the connection fittings. This plastic insert is inexpensive, but it could prevent a large problem. I have seen where plumbers were not too careful when doing an installation of a new unit. If you have an older unit with corrosion, you may be able to make a repair. Turn the water off to the water heater. 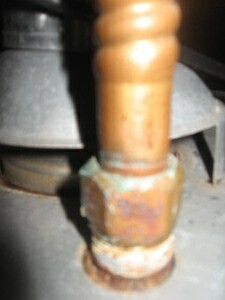 Drain the water heater, or at least be prepared for water in the line when you disconnect the fitting. Sand off the corrosion, but do not sand down the threads. Put a new plastic insert into place, and you can reattach the fitting. This procedure will prevent further corrosion. This entry was posted on Monday, November 22nd, 2010 at 2:00 pm	and is filed under Home Maintenance-Consumer Info. You can follow any responses to this entry through the RSS 2.0 feed.